sqadia.com offers supplements to medical students in the form of medical video lectures delivered by experienced medical practitioners. 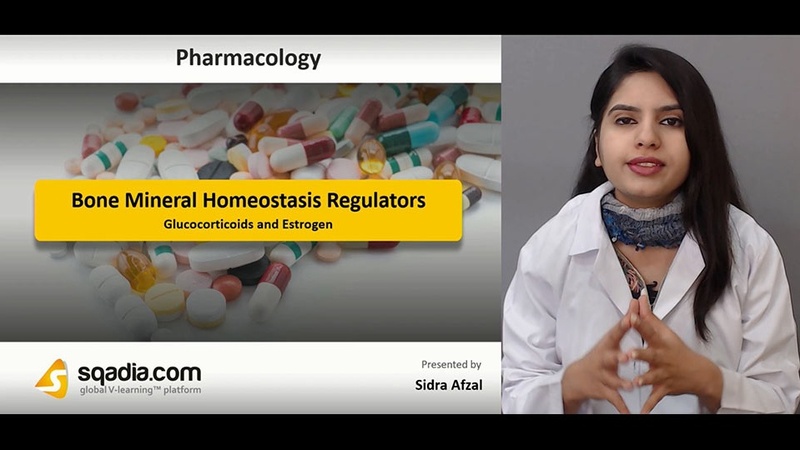 In view of this mission, sqadia.com offers variety of medical lectures covering various aspects of pharmacology. In this medical video lecture, Mineral homeostasis has been brought into light. Mineral homeostasis involves complex interaction between various organs. This interplay is regulated by various hormones which can synthetically be prepared as well. Bone mineral homeostasis refers to the control of levels of two ions mainly calcium and phosphate mainly by three hormones parathyroid hormone (PTH), vitamin D and fibroblast growth factor 23. 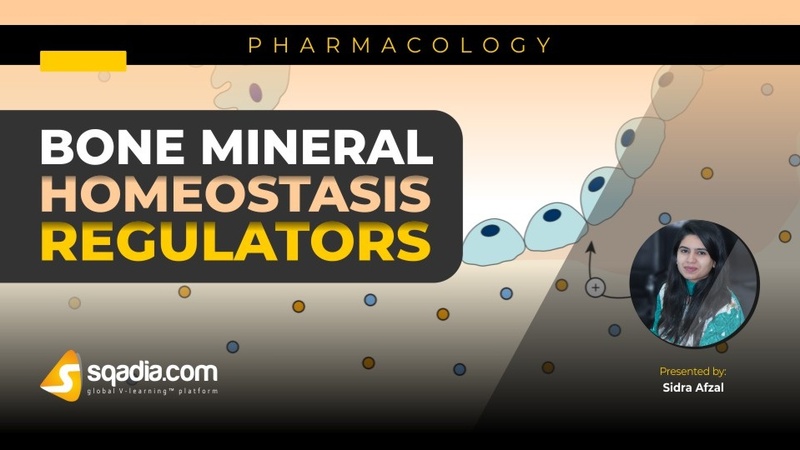 Calcitonin, glucocorticoids and estrogens have been employed as mineral homeostasis regulators. Each one of these has beneficial aspects along with certain side effects which can be associated with these, individually. 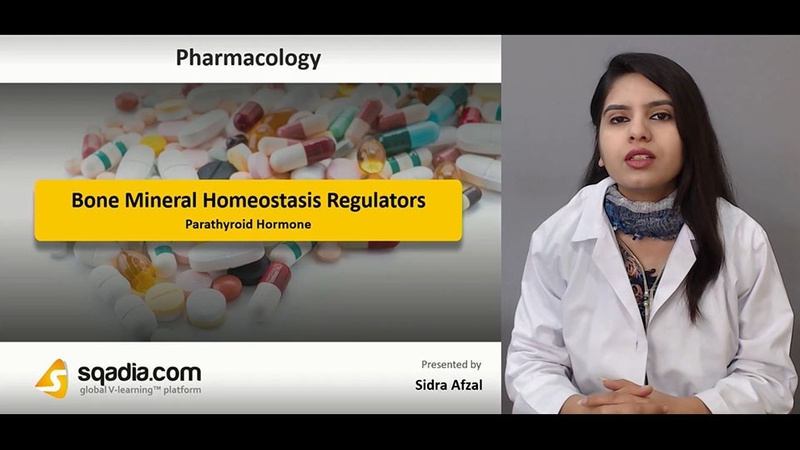 For MBBS students, detailed explanation of parathyroid hormone is delivered under the lecture title bone mineral homeostasis regulators. Parathyroid hormone (PTH) is secreted by human parathyroid gland and it plays a significant role in bone remodelling. A range of drugs are employed as agents for bone mineral homeostasis. These include both hormonal regulators (parathyroid hormone, calcitonin) and non-hormonal regulators (biphosphates, thiazides). Teriparatide is a recombinant PTH form. Parathyroid hormone maintains normal extracellular calcium levels by stimulating intestinal absorption and decreasing urinary calcium excretion. It is either subcutaneously or intravenously injected and has many pros and cons associated with it. Beneficial aspects include anabolic effect on bones and treatment of osteoporosis. However, nausea, drowsiness, headache and arthralgias are common side effects. Vitamin D and Calcitonin is discussed expansively in the medical video lecture at the platform of sqadia.com for medical and MBBS students. Vitamin D, for example calcitriol and cholecalciferol, is a prohormone and is first hydroxylated in liver. It acts on gastrointestinal tract (GIT) and binds to alpha protein in the blood. It is used in medical conditions like rickets, hypocalcaemia and osteomalacia however, constipation, renal failure, weakness, polyuria b polydipsia are the common side effects. Calcitonin, on the other hand, is injected either by subcutaneous or intranasal route. It is used to treat hypercalcemia and Paget’s bone disease. Side effects majorly linked with this drug are nausea, vomiting, local hypersensitivity and facial flushing. are used as treatment strategy for hypercalcemia owing to malignancies or vitamin D intoxication. Estrogens, on the other hand, assist in maintaining bone integrity and inhibit cytokines recruiting osteoclasts. It acts on various cells encompassing T-cells, osteocytes, osteoblasts and osteoclasts. It is well-absorbed in gastrointestinal tract (GIT) and is employed as hormone replacement therapy and prevents postmenopausal osteoporosis. Side affects which are mainly associated with these are hot flashes and leg cramps and venous thromboembolism.